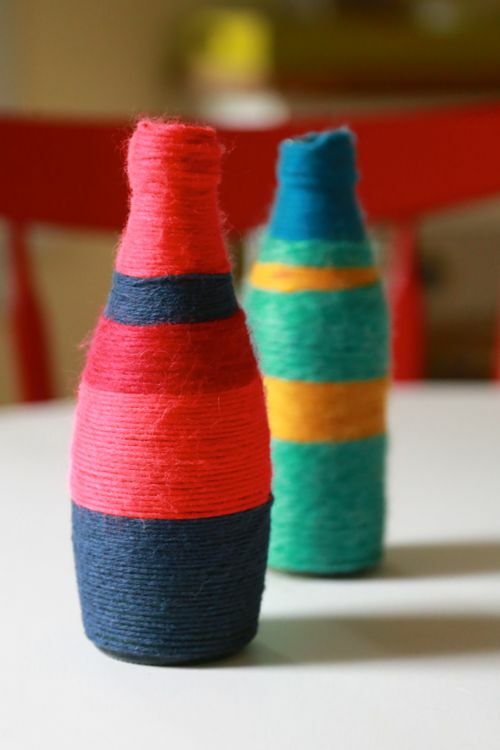 Wrapping twine around bottles is one of the oldest handcrafts in the western world. Hundreds of years ago, people would use elaborate series of knots to incase glass bottles, not only as a form of decoration, but as a way to mark their property (things could get confusing down at the town water well!). 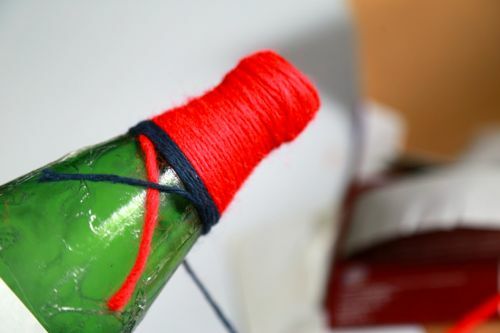 The craft has come a long way since then, and wrapping yarn around bottles with glue has since taken over, but, if you have ever tried to wrap yarn around a non-straight surface you know the truth: it's actually really hard. You think it'll be easy - but it isn't; the glue slip-slides on the glass and the yarn rides up as you move along making it so you have to stop and let the glue dry every inch or so. It isn't easy....or shall I say, it wasn't easy. Good news! I found the secret ingredient that makes this process super easy. 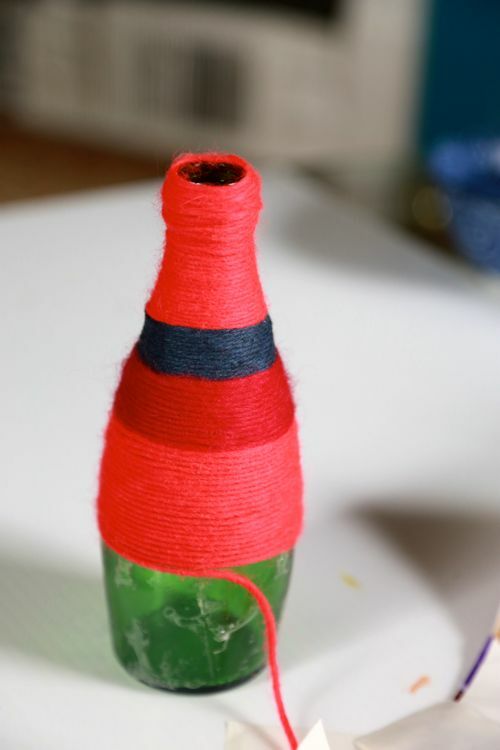 No more messy glue globs or wrestling the yarn from keeping it from creeping up as you work along. Want to know how you can turn one out in under 30 minutes? Let's go! 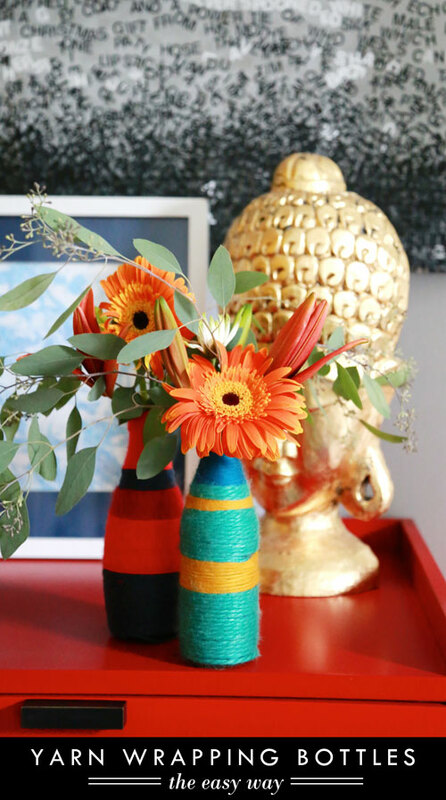 If you have never worked with fabric adhesive sheets, prepare to be amazed! Imagine a piece of double-sided tape about 4" square and ten times stickier. It's awesome. 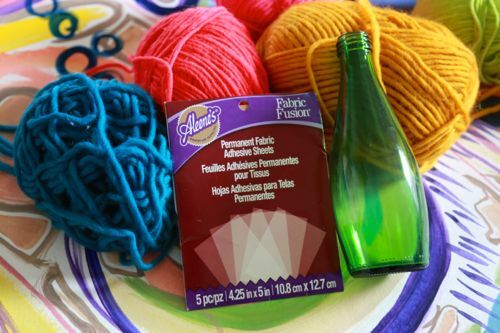 It works just great on fabric, but it's also great for hard-to-stick surfaces like glass and wooly yarn. 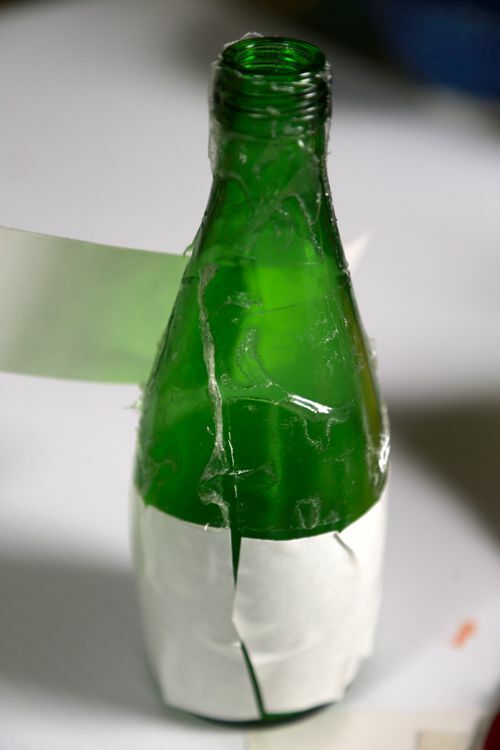 Slice the sheets into narrower strips (mine are about 2" but the bottle size will matter most) then peel off one side, then patch them over the surface of the bottle. Don't worry if there are a few exposed cracks, just be sure to cover most of the glass, especially where there are curves or ridges. You may want to use the back of a spoon or marker to help rub the surface a little more. Don't worry about wrinkling the paper - it's going away very soon! 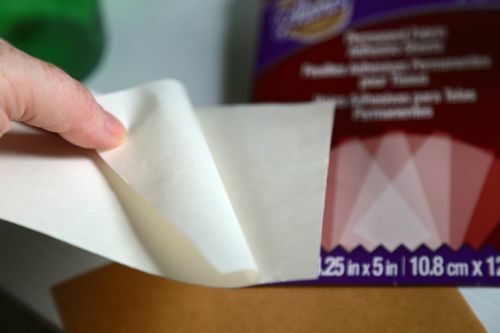 Peel off the piece of paper backing from the top portion of the bottle. You'll want to keep the bottom covered for a little while so you'll have some place to grip. Start wrapping the bottle working from the top down. 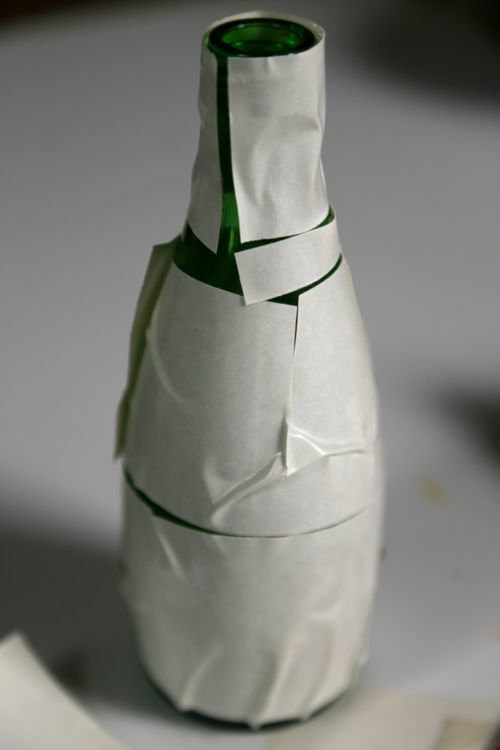 If your bottle has a threaded top (where the cap screws on) you may want to double wrap this part. Keep working your way down. When you want to switch the yarn, don't just snip and begin a new one; allow an extra inch of the first yarn to come down on a diagonal and stick it down thoroughly. For the second/new yarn, do just the opposite; start from a downward diagonal and work your way up. 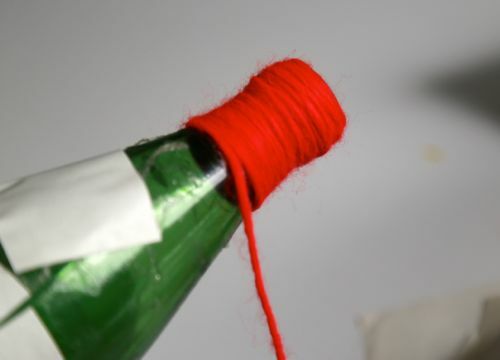 This method will help keep unraveling yarn ends to a minimum. 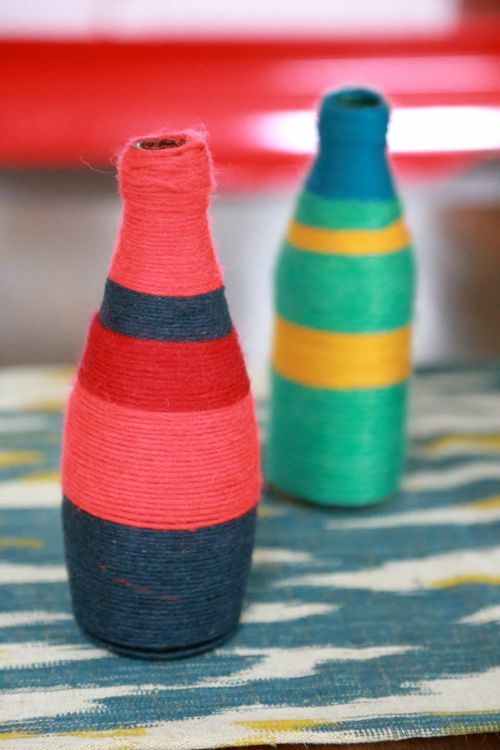 If this seems confusing, or you are working with kids, you can also prevent yarn from unraveling with a dab of Tacky Glue. Keep wrapping and switching...wrapping and switching. If you were using regular glue here all that yarn would be riding up and glue would be oozing out between each row. Yay for adhesive sheets! And there you have it. Ain't she pretty? 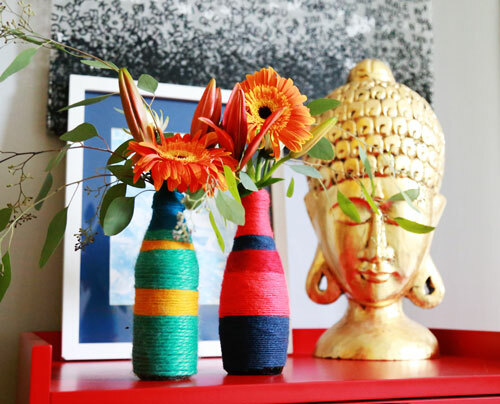 They look pretty swell on their own as a sculptural punch of color, or add some flowers. Both yarn and Aleen's adhesive sheets are waterproof, so you don't have to worry about your bottle coming apart if it gets a little wet. You can turn out a fantastic bottle in under 30 minutes, or make a whole batch in an afternoon. 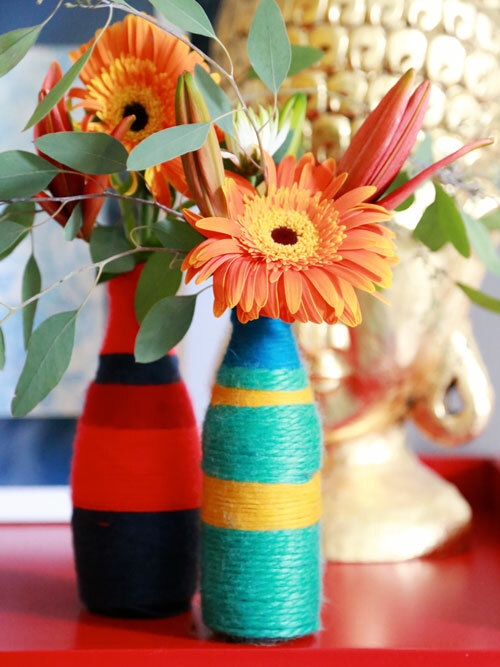 They would be fun for a party craft, or make them ahead of the event and bunch them together on the table as a centerpiece. The fun awaits! Aunt Peaches, you are brilliant!